This 5 bedroom villa with private pool is located in Manciano and sleeps 12 people. It has WiFi and barbeque facilities. The villa is near a beach. Detached house, 8 - 12 people, 7 room/s, 5 bedroom/s, 3 bathroom/s, approximately 200 m², 2 floor/s. Furnishing: rustic, good, tiled floor, cotto floor. Gas for heating according to consumption approximately € 1.20/​liter. Firewood if required. Linen/towels available. Change of bed linen, € 4 per person, Change of towels, € 3 per person. Deposit € 200 (in cash). Cot/​High chair 2x available, free of charge (on order). Pet 2 animals allowed, € 30 per pet and stay (please advise prior to arrival). Situation: rural, solitary, sea view, panoramic view. Estate (private use): (whole estate 2 ha) (fence, entrance gate), terraced, with plants, well-kept, grapevines, olive trees. Pool (private use): 12.0 x 4.0 m, 0.50 - 1.40 m deep, 18/05/19-05/10/19, pool maintenance by the owner 7 time(s) per week. Pool area: lawn for sunbathing, external shower. Sports facilities/ leisure time: private use (free of charge): children's playground. Plot description: Access: gravel road, approximately 100 m.
2 x parking on the estate (roofed). Reserved open space (under trees), reserved open space, furnishing provided (benches), deck chairs, brick barbecue, pizza oven. The villa is described as good value for money. 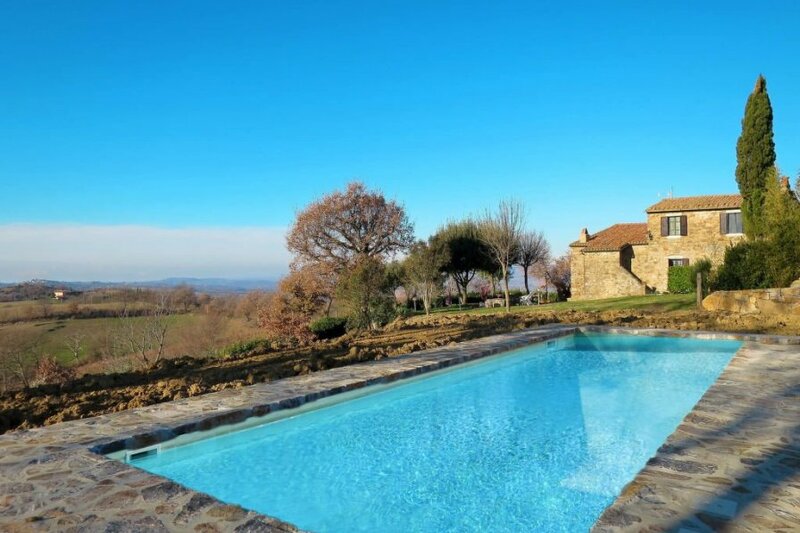 It has a private pool and is located in Manciano. The nearest airport is 129km away. It is set in a convenient location, just 0 metres away from a beach and 11km away from the city center. The villa is suitable for family friendly summer holidays as well as relaxing winter holidays. It is also suitable for elderly guests.